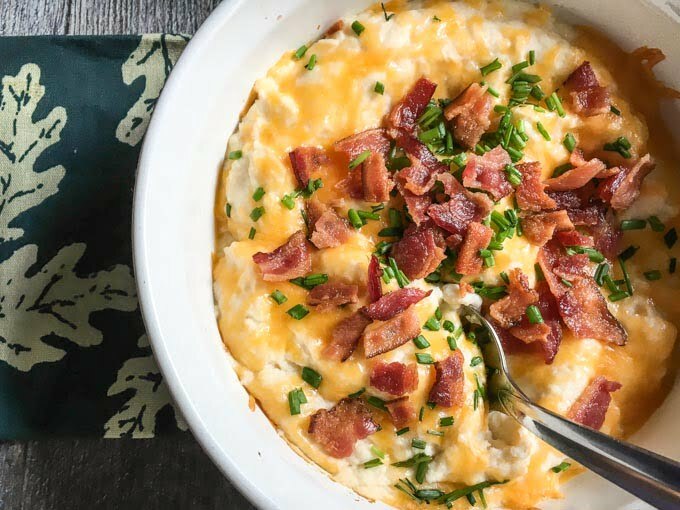 This loaded mashed cauliflower casserole is a delicious low carb side dish for the holidays. Only 3.6g net carbs per serving. You might also like this low carb creamy green bean casserole or this low carb cheesy scalloped cauliflower recipe. 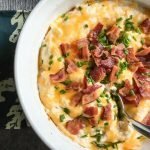 With the holidays coming up, I wanted to think of some low carb dishes I could serve or bring that everyone would like. In other words something that wouldn’t make the guests say, “oh is that a low carb dish?” I remembered my mom used to make a twice baked potato casserole that wasn’t low carb but very delicious. This is a riff on that dish and turned out fantastic! It’s my loaded mashed cauliflower casserole. You probably have guessed that I am a cauliflower fan. I have a 10 awesome cauliflower recipes post to prove it! 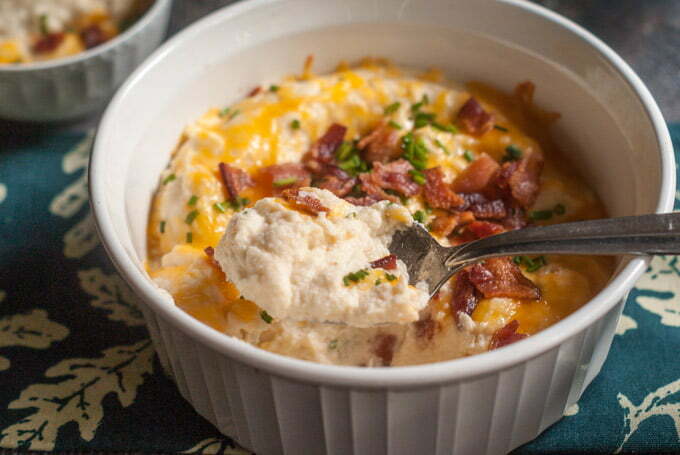 I’m to the point now where I like mashed cauliflower just as much if not more than mashed potatoes and have used it differently in many of my recipes. So true to my mother’s recipe I added French onion dip in with the cauliflower which gave it lots flavor on the inside and then the uusal loaded toppings of bacon, cheddar and chives. The cauliflower was cooked in the microwave first, pureed in a high speed blender with a few more ingredients and then baked until the cheese was nice and melted. Add the chopped up cauliflower to a large bowl and microwave for 15 minutes. While that is cooking, make your bacon and chop your chives. When the cauliflower is done, add it to a high speed blend along with the onion dip, salt and cream cheese. You may have to do this in two batches. Add the mashed cauliflower to a baking dish. If working in batches mix everything well and then top with cheese. Bake for about 10 minutes or until the cheese is nice and melted to your liking. Take it out of the oven, top with crumbled bacon and chives. Previous Post: « Low Carb & Sugar Free Cranberry Sauce – Only 20 minutes to make! I absolutely LOVE mashed cauliflower! Just made some the other night with broccoli thrown in. Pinning for later, thanks for sharing! I love this alternative to mashed potatoes. I don’t know that I will do it for Thanksgiving but I have made a blend of cauliflower and potatoes for my kids so they are getting used to the texture and taste. They would love this. Thank you for sharing. this looks delicious!! I love cauliflower – Would love to have you come share at the What’s for Dinner Link up! Yummy! 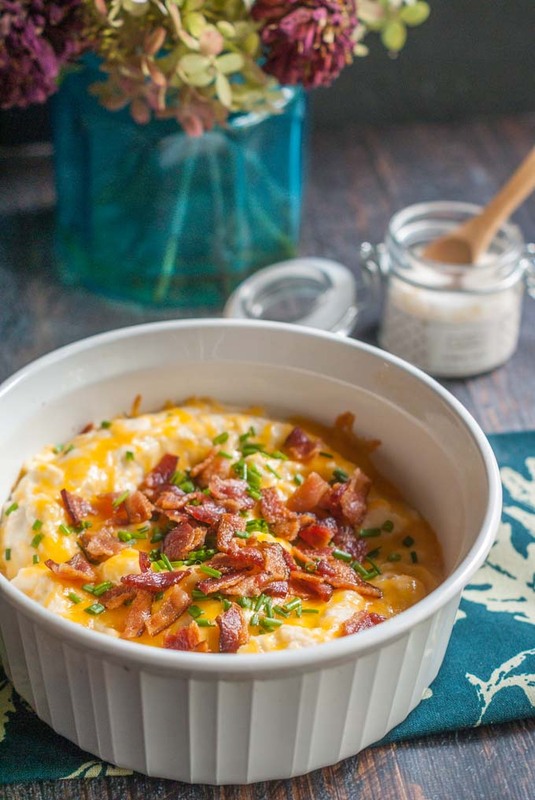 What a great way to serve mashed cauliflower! Thanks! I really liked it and can’t wait to make it for Thanksgiving this year. Your cauliflower casserole is absolutely brilliant! (Pinning!) Quick question: I presume the French Onion Dip is ready to go dip….Not the powder, yes? Sorry for taking so long to get back to you! I meant the ready made French onion dip. Sorry for the confusion. This does sound like a winner! Love the french onion soup dip. I would finish that off too! Looks like a tasty way to enjoy cauliflower!